Lou Liberatore and Christopher Sutton. Photo credit:Andy Evan Cohen. 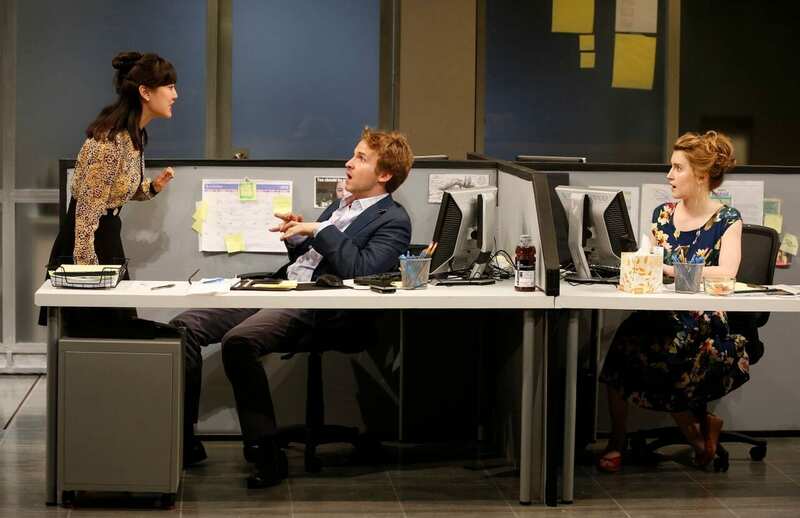 With God Shows Up Playwright Peter Filichia presents a compelling and entertaining existential romp through dogma, philosophy, and the meaning of life. Fun surprises, plot twists and one liners abound! It’s a fun night out that will have you talking so definitely bring friends. We’re in a hushed studio witnessing the opening of a live televangelist broadcast. Our hero, Dr. Thomas Isaac Rehan (Christopher Sutton) has the perfect wavy hair, impeccably tailored suit, crucifixion cuff links, comforting voice, dimples, and engaging pearly white toothy smile rehearsed to bring heathens to the Lord. Even his nom de plume is a perfect amalgam of Christian, Jewish and Muslim for mass appeal. His repartee soon effectuates to pitch religious wares to his TV audience flock. Everything is for sale in the name of the Lord from our consummate salesman, from studio audience seats to Christian ketchup, “lettuce relish the Lord”. He recites continued clever and humorous aphorisms to guide us toward holy redemption. We smile and cannot resist trusting him. To our delight, our hero announces with great excitement that God (Lou Liberatore) is scheduled to appear on today’s broadcast. He discovered this in a letter he recently received from God. It’s on real God stationary – a new relic. We wonder, is God a he, she, ghost, or triumvirate aberration? What profundity will God explicate? So many questions. God arrives and is a little taken back that the large studio crowd had to pay admission. He’s charming, relaxed, a little unkempt, but we like him and quickly discover that he’s not going to support the preacher’s bargain basement fire sale. As our hero barely maintains his demeanor, God methodically exposes him as a pitiful, money-grubbing charlatan. 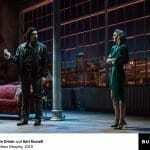 Then God (Maggie Bofil) arrives again – the female version. Both Gods assure us we are all male and female and designed to enjoy any configuration. Where has God been for the last millennium or so? He/she answers – on Serendipity, the twin planet to earth. Dr. Rehan is stunned at this revelation. People do not take the bible literally on Serendipity and are much more compassionate spending their money on pets vs. preachers. Dr. Rehan is increasingly put in his place, snaps and descends dramatically to a fiery place when his whole world is invalid. A tornado and hurricane strike and thinking he is off air gives God a piece of his mind. The station was still televising and it does not end well for our preacher. God Shows Up is great ecclesiastical fun and delightfully examines humankind’s favorite life questions. Nietzsche would give it 5 stars and I too highly recommend it, even if God frowns at audiences that have to pay admission – indulge! 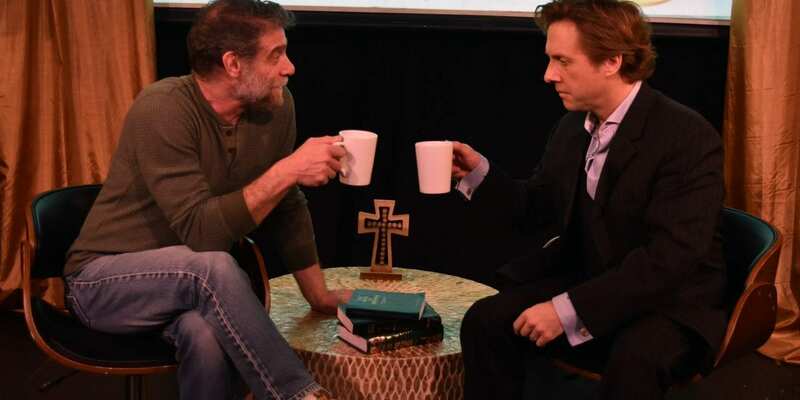 God Shows Up: Written by Peter Filichia; directed by Christopher Scott; presented by Eric Krebs. With: Maggie Bofill (Roberta), Lou Liberatore (God), Christopher Sutton (Dr. Thomas Isaac Rehan). Projection and sound by Andy Evan Cohen; lights by Joan Racho-Jansen; set by Josh Iacovelli; costumes by Michael Piatkowski; stage manager Craig M. Rosenthal; assistant stage manager Matt Balfour; press by Richard Hillman PR. Performances will begin on Thursday, January 3, at 7:00 pm (for a limited engagement through February 21, 2019) at The Playroom Theater 151 West 46thStreet between Broadway and 6thAvenue.Opening Night is set for Sunday, February 10 at 7:00 pm. Tickets $20 on Eventbrite.com. Run time 80 minutes with no intermission.